This Healthy Banana Cream Pie is easy, delicious, and only requires a few ingredients. 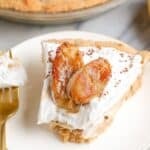 Flaky gluten-free graham cracker crust, creamy banana cream filling, and delicious coconut whip on top. 2 tbsp cornstarch, whisked with a little bit of cold water in separate bowl to form a runny ‘glue’ like texture. This prevents clumping and is a necessary step. 1 can coconut cream or 1 can full fat coconut milk that has been chilled in fridge overnight, top part scooped out (CREAMY). My favorite brand for this is Wild Harvest or Whole Foods 365 Full Fat – they worked the best out of all of them. Preheat oven to 350F. Prepare pie dish by greasing. In a large bowl, mix the almond flour, baking powder, cinnamon, and salt with a whisk. In a small bowl, combine egg, maple syrup, and oil. Press into greased pie dish and pierce with fork. Bake for 14-16 minutes or until golden brown. Let cool completely before adding banana topping. In a sauce pan, heat coconut milk and maple syrup over medium heat until bubbles start to form. Whisk in cornstarch mixture vigorously and stir every so often. Once it starts to boil rapidly, keep stirring for 2-3 minutes or until thickens. The mixture should have thickened and looks slightly jiggly. Turn off heat once slightly thickened, continuing to whisk. Pour into bowl, cover with plastic wrap, and let cool in refrigerator for minimum two hours. While cooling, it’s time to make the coconut whipped cream. Using a hand mixer and a COLD bowl, beat coconut cream (top part of can), maple syrup, and vanilla until fluffy. Store in fridge until ready to use. When two hours is up, whisk coconut/cornstarch mixture from the fridge. There may be a few small clumps but that is okay. Gently fold in 1/2 cup of the coconut whipped cream. Once combined, slice a banana and place the slices at the bottom of the crust. Pour the coconut mixture over top of the bananas and refrigerate minimum two hours. Top with the rest of the whipped cream and chill for minimum 4 hours or overnight. Top more banana slices and chocolate shavings before serving. You can also caramelize bananas in a pan with a little coconut sugar and cinnamon over high heat for ~3 minutes for an added touch. Enjoy pie within three days.